This bank holiday was well timed for me. Some time to spend surrounded by beads, my sewing machine and yarn. I am currently working on a shawl for a wedding I'm going to. I'm also promoting my creative networking event. The main mission behind this event is to share the collaborations and support I have had in the last six months and beyond. With that in mind I offered to help my friend Paisley Immy Cakes at the Space Hopper Events Jubilee vintage and Craft Fair. This woman makes amazing cup cakes and can turn her hand to just about any type of cake, even gluten free. I've never been to a craft fair as a stall holder so I had no idea what to expect. Sometimes when trying to helpful you can be more of a hinderance therefore I let Paisley Immy guide me through. I ran some chores and by the time I got back this fabulous table of cakes, homemade aprons, baking accessories and jam appeared. 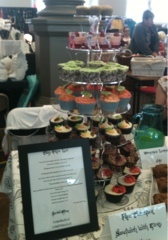 We went through the cup cake fillings and the new products. 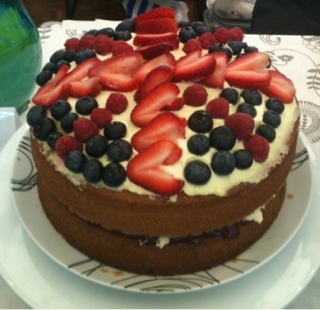 Centre stage was the most beautiful Victoria sponge, it was topped with fresh fruit. The cake was so pretty and it seems a shame to cut into the cake and many agreed. 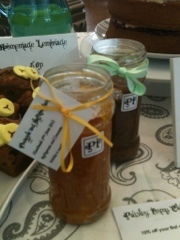 However, once the first slice was sold it was like bees around a honey pot there was a hive of activity excuse the puns. 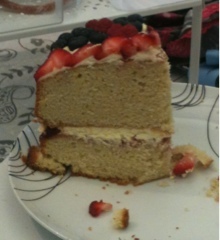 The cake was a large deep filled creation and ended looking like this within 15 minutes. 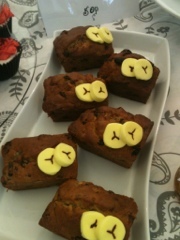 The time flew today and so did the cakes off the stall. The rhubarb & custard flavour sold out along with chocolate & cherry. The stall was placed between a jewellery stall and a vintage stall. I did buy some sterling silver pearl earrings which came with a certificate of authenticity. I did have a walk around to see what other stall holders were selling and get ideas about whether I should do a craft fair, the jury is still out in my head but never say never. Thank you Paisley Immy Cakes for today, keep being an amazing baker and good egg.